Lily of St. Leonards Lily of St. Leonards: It's only the SNP that holds Scotland back. Some governments have the idea that they somehow create wealth, whereas everyone knows in reality they don't. Only hard working and innovative individuals generate jobs, pay taxes and create a sustainable economy. Our current government regrettably have made this deliberate mistake and that is the reason why the SNP's Growth Report misses the target by some margin. The Scandinavian analogies are well worth examining. As the territory in which the Celtic and Northern worlds, overlap, Scotland is in a *very* interesting position, both geographically and culturally. Summed up beautifully in the last two paragraphs. SNP ruining the country. Yes that reduction in crime, free healthcare and free university is making life hell on earth. The welfare cuts and constant testing of sick and disabled people is just an inconvenience. The killing of the economy with the blight of Brexit is just a temporary thing of course so can be ignored. Whatever you chose to name it, civic nationalism is fuelled by questionable authority. The Kalmar Union, uniting all the Northern realms, stretched from the marches of Russia to the other side of the Atlantic, from Pomerania to the Arctic. It was the largest experiment in political union until modern times. In its unmitigated form, it lasted nearly as long as the current United Kingdom. Its (diminished) constituents lasted into the twentieth central. Denmark (including at the time what are now the southernmost counties of Sweden) held more than half the population of The North. One consequence of this is that Copenhagen, once in effect the capital of everywhere from Russia to the fringes of the Americas, is so spectacularly out of proportion to the rest of modern Denmark. My apologies: for 'central' read 'century'. The history of the North has been one of poverty, violence, and oppression, in an environment that is trying to eliminate one for several months every year. On top of this, outside powers have constantly attacked, annexed, and laid waste. Today, most of the territories of the old Kalmar Union now belong to the Nordic Council, whether as independent sovereign states or as autonomous regions enjoying extensive self-government. They enjoy impressive standards of living. I once asked a Danish economist what were the competitive advantages of Denmark. He thought for a moment and said "Our chief competitive advantage, I think, is that we have no competitive advantages. If we don't organize ourselves properly, we'll all die of starvation next winter." Allowing for some important differences amongst the various Northern lands, a common theme in their evolution has been high taxation, high public expenditure, and high standards of service. Among the fruits of this approach have been a healthy and skilled workforce, organizations in every sector able to respond with flexibility and to plan strategically, and a capacity to collaborate internationally without états d'âme. All this is, of course, currently under attack from that set of ideas and practices known (for reasons which quite escape me) as neoliberalism. Asset-stripping and fiscal sleight-of-hand have put Denmark particularly in a very bad case. Nevertheless, alert citizens are putting up a stout resistance in every one of the Northern lands. It is not hard to see why sensible governments would study the policy of those countries, or why Scottish ministers might be seen giving interviews in decent Norwegian on Norwegian television. Everything changes, sometimes slowly other times spectacularly fast. The Roman Empire was to Europe as Russia was to its satellites. Just look at Italy today and try to imagine it telling Germany how to play the game using its rules rather than Merkel's. It's unclear to me what point you're making re Copenhagen and its changing political significance in the Baltic and beyond Simon? Denmark today is a country of the same order of magnitude as Scotland. The size of its capital, however, is indicative of its earlier sway. If by 'its satellites' you mean the other 14 Union Republics, the parallel with the res publica Romana is rather remote. If you also include the members of the ci-devant Warsaw Pact, then your parallel recalls Euclid's dictum about what parallel lines never do even if produced to infinity. It doesn't fit the narrative here.....so you should expect no replies. There are a rump of Unionists in Scotland who not only challenge every single thing the SNP do regardless of area of competence. They perversely also accept with no thought everything that the London parties put forward. The continuous acts of negativity towards the SNP government they see as a stalwart and in fact a requirement of what they believe to be 'good' unionist 'thinking'. There*is* a rump of Unionists, surely? If (and only if) I've understood Ephie correctly, she no longer holds independence to be both impossible and unconscionable, but rather a completely neutral trope. It would appear now that independence is impeded by the unsuitability of the population, who have been rendered unfit for it by the SNP. This is predicated on the SNP's having the capacity to effect qualitatively substantial change in the psychological make-up of the entire population during the few years that it has been in power. Mirabile dictu! On the relative risks involved in Brexit compared to those attached to Scottish independence, I'd have thought most nationalists would realise the finality of their proposal is non-negotiable. David Cameron made this abundantly clear in 2014. Independence is a one-way street and a clear majority quite sensibly refused to take the risks involved that September. Nationalists happily put their financial concerns aside and allow their belief in Scottish sovereignty to over-rule all else. That is their privilege and their right, but when their fellow countrymen chose a different path for their country's future, they need to accept democracy or face the consequences. Wilson's discussion paper offered a degree of honesty missing in the White paper as sponsored by Salmond. It's an altogether more mature document where oil is no longer the commodity that would act as security for the transition phase between Scotland leaving its relationship with the UK and forging its own path. Its description of Scottish politics has a strong pro-business focus, recognising that the success of a small economy depends on the ability of strong domestic industries to sell specialised, home-grown products in global markets. This has created a seismic rift within those left-wing socialist groups within the party who now feel deceived and ignored by the leadership. 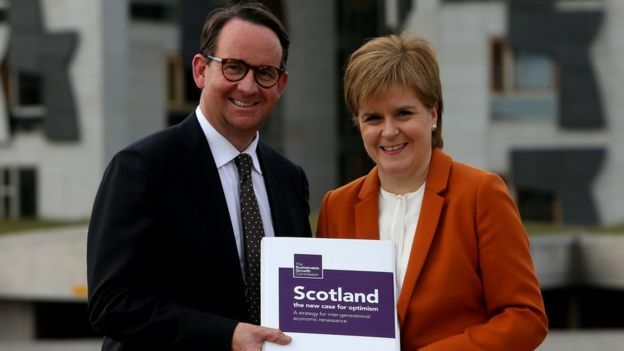 The economic blueprint has many deficiencies and erroneous assumptions that suggest it wasn't written by a bone fide economist but by a panel chosen by its sponsor, the SNP. It miscalculates the real Scots economy when it fails to recognise our true GDP with the one projected. An analysis by John McLaren, an experienced economist who gave advice to this SNP study, found the country’s actual wealth (based on what Scottish companies, institutions and individuals owned) was nearly £3,000 lower per head than its headline GDP figure. The comments made on this page by some advocates of nationalism clearly illustrate they've learnt none of the skills needed to entice NO voters to reconsider their position. The Nordic Council offers a very useful model for working unity between sovereign territories. Economic, social, and cultural co-operation proceed unimpeded, and no member assumes a hegemonic rôle. By the way, I've asked Danish friends for an explanation of the expression'learning to be good little Danes'. I'm still waiting for one of them to reply. Lucky I wasn't holding my breath! Fair's fair running man. Scot Goes Pop now deletes all my comments. We will just have to exist in our respective bubbles I'm afraid! I am happy for people to comment & disagree, but I require reasonable levels of politeness. That is all. I don't think you're asking too much, Effie. Can I ask, would you contemplate independence if it were driven by another major party? Devolution would never have happened if it had remained a purely SNP goal; but as soon as Labour backed it, it went through within a couple of years. I often get the impression that it's the same with independence - there are people who, like yourself, believe independence could work, but who would never in a million years dream of giving the SNP the satisfaction of claiming it was their doing. If Labour or even the Tories took the project on, however, they would vote for it like a shot (not least because, deprived of its raison d'être, the SNP would quickly fragment and ultimately dissolve). Thoughts? I wouldn't vote for Scottish independence for the same reason few New Yorkers would vote for independence. They are Americans, I am British. If the SNP dropped independence as a policy & expanded throughout the UK they could be successful like their Northern League counterparts in Italy. My problem with the SNP is not that they want independence. Other than that some of their policies are no worse than those of other parties. The problem is not the SNP, the problem is independence. But of course independence is possible. I don't think it's desirable. In the end though it's not about the economics.